I’ve always been a good little traveler, wowing the business men in first class at age 2 with my impeccable behavior (while indulging in some airplane ravioli with my mom.) Some of my prouder travel feats include accidentally sneaking a large pair of scissors into Mexico, having to traverse the Madrid airport with a phone on 1% and my travel buddy in airport prison, and getting the window seat pretty much every time I fly… Even when I’m boarding group C on Southwest. I revel in packing, prepping, and planning for a trip, and can quite honestly say I’m at my happiest when I’m somewhere other than where I typically am. 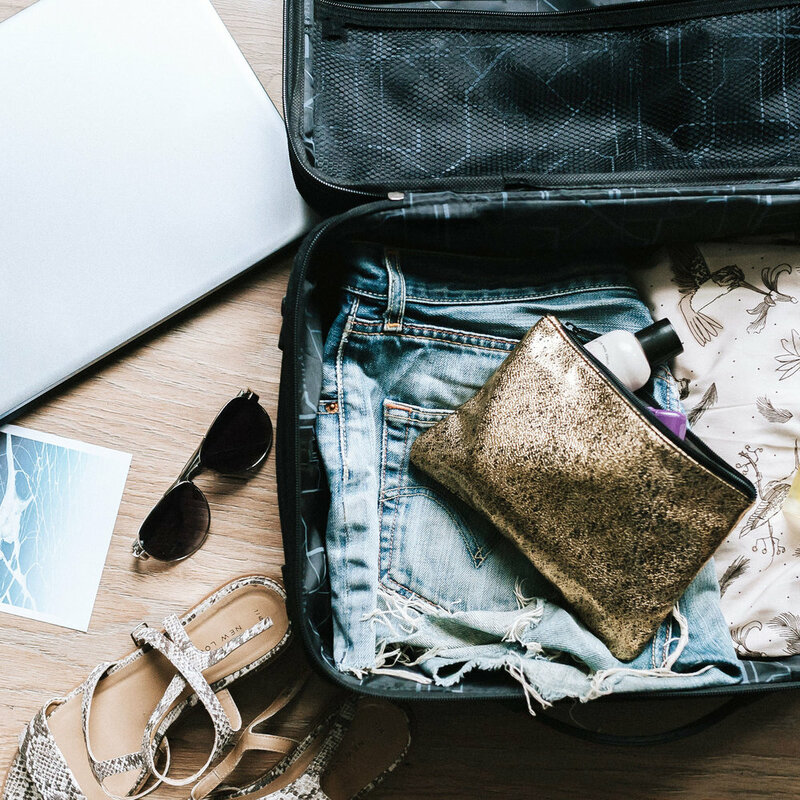 While I take my travel shopping very seriously and love brainstorming a wardrobe for trips, there are a few things I can’t travel without from pieces of clothing and beauty products to tech gadgets, snacks, and apps. Who wants to sit in jeans on a flight?! I’ll do it sometimes (if the outfit needs it), but MUCH prefer to wear joggers, leggings, or harem pants. If I’m flying for work and don’t want to wear jeans, I’ll just slip on a light dress. For work: flowy button down. For play: Wildfox graphic tee or Brandy Melville Tee. For work: Madewell cardigan. For play: Brandy Melville cropped hoodie. For work: Maddy mules (yes they exist.) I look professional but fun and don’t have to walk through the airport in heels. For play: slide-on sneakers like the Steve Madden Zaander Slip-On. I always head to the bathroom just before we start our descent so that I can make any makeup and hair touch-ups before landing and leave the plane feeling refreshed. I love that the Baby Lips PH Lip Balm in 01 my Pink changes color to fit your skin tone based on your specific PH! It's hydrating, smells amazing, and is a great way to add some color and look put together without having to fuss with lipstick on the plane. Planes can make your skin extremely dry, and when my skin gets dry it starts producing way too much oil! I pretty much always have oil blotting sheets on hand, especially when I travel. You never know where you’ll end up and if you’ll have time to touch up makeup. Since airplanes are so dry, a little spritz of Beautycounter No. 2 Plumping Facial Mist or some Laura Mercier Tinted Moisturizer makes my skin feel refreshed and revitalized before stepping off my flight. Airplane rides leave some of us a little more pale than others (I always have a little flight anxiety and will lose the color from my face during the trip) so I will dab a little Benefit Benetint on the apples of my cheeks for color. Also great as a lip stain alone or with a coat of Babylips PH! If I don’t have much time to touch up makeup, I’ll just powder my T-zone with a little Bare Minerals Matte Foundation before I get off the flight so my skin tone looks more even and less shiny. If my hair isn’t in a top knot on the plane or I have somewhere I need to be (or someone I’m meeting) right after the flight, I’ll use a rat tail comb to add a little volume and freshen myself up. If I have to pull my hair up during a flight, I’ll use a no-crease hair tie or Invisibobble to do so. Since I’m likely rocking second day hair and didn’t put much effort into my look, I don’t want to use a skinny ponytail in such a dry atmosphere because my hair will be too brittle! I always get dark circles after flights (hello, stress and travel exhaustion) so I like to keep my Benefit Boi-ing Airbrush Concealer in my small makeup bag. I pat some on under my eyes to make myself look less tired. Even if I’m not at work, I’m still working! I like to have my full laptop instead of my iPad on flights because plane rides are a great time to get some photo editing or writing done. If I have NO work to accomplish during a trip, I’ll likely read an entire book in the airports and on the planes alone. I opt for books that I may have a hard time focusing on or reading during my busy day-to-day, like war novels (yes I love them) or fictional stories. Some of my favorite travel reads so far have been Yellow Birds, Tell the Wolves I’m Home, What Alice Forgot, and Where The Red Fern Grows. When I was a kid, my mom would always pick up a copy of InStyle at the airport and we would go through all the looks comparing celebrities’ red carpet styles and picking which we would wear. Now, I don’t feel complete if I don’t grab a copy of InStyle, Vogue, or Glamour before my flight! I get a ton of tension and sinus headaches, and flying puts me at risk for both! I'll bring peppermint essential oil with me and dab it on my wrists and temples or take a whiff when I feel a headache coming on. I also like putting it on my He Gu (LI-4) pressure point since it's easy to access and said to move Qi in your bod! I always keep a mini pill box in my bag since I have to take so many vitamins for my Copper Toxicity. I got mine from Uncommon Goods years ago, but you can find a ton on Etsy! I’m not an advocate for taking pain medicine regularly, but I’ll keep a few Advil in my pill box in case I get any sinus headaches from the altitude or feel like I have any inflammation in my body that will prevent me from traveling my best. I’d much rather access my boarding pass by downloading it to my Apple Wallet than worrying about the physical thing! Kayak and Momondo are my two most-used apps when it comes to comparing fares and finding flights. I’m also a HUGE lover of Scott’s Cheap Flights, which has amazing amazing deals for international travel. Hotel Tonight is a super popular app if you're looking to score hotel deals (and don't mind being unsure of where you're staying a day in advance.) If I’m traveling abroad, Hostelworld is my favorite hostel booking service to use! If you are worried about prices, you can always download others and compare but I think this one is super reliable. You can always trust a Yelp review in my opinion. Why I love Triposo: You can access maps, attractions, and reviews offline… This was great when I was in Morocco! Uber Who? I prefer LyftLines to any other ride share service. If you’re looking to take public transportation, just type in your destination on the App Store with the phrases “transit”, “busses”, or “public transportation” and see what apps they have. What better way to outline an itinerary than looking at what influencers and bloggers are sharing about that city on Instagram? You can also decipher the quality of the food, ambiance, and what kind of dress is appropriate. I had to get TSA Pre-Check when I worked for Bumble, and it was the best investment. You get through security so much faster, especially during peak travel seasons, and you don’t have to take off your shoes. Win! I know I know, it’s not smart to carry a ton of cash on your body (especially if you’re great at losing things like me.) I, however, will always carry cash when I travel for two reasons: I don’t want to lose track of my spending, and it won’t freak my credit card company out as much. I normally always take off listening to “Edge of Glory” by Lady Gaga, but like to have a playlist of relatively upbeat and/or new music for while I’m in the air. You can find my favorite travel playlist here! I’ll create a playlist or add new songs to my travel playlist the day before I leave so I have something new to listen to. If you love travel like me, I’m sure you have your own little travel routine. I’d love to hear what it entails! Hopefully these recommendations help you travel smarter, healthier, and in style!